Don’t take it from us. It’s a well-known fact that the closer the holidays get, the harder it will be to find the ideal location for your 2018 company or family holiday gathering. So as our gift to you for booking your holiday party before the rush, Tuscany in Wheeling is offering 10 percent off your party when you reserve before Nov. 15, 2018. Located in north suburban Wheeling, Tuscany is the perfect destination for discovering the setting of a Tuscan village. Besides one-of-a-kind pasta dishes, we also offer the fine steaks and fresh seafood prepared by our executive chef Bolla Loza. 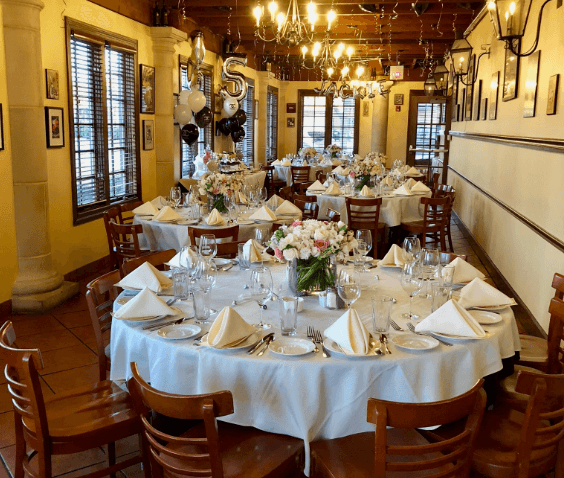 Tuscany in Wheeling offers three private dining rooms perfect for all holiday parties. Our Montecatini Room can accommodate up to 25 guests. The Siena Lucca Room can accommodate up to 35 guests, and the Florence Room can accommodate up to 80 guests. Our Private Dining Menu includes a cocktail party package, family style lunch options, chefs plated lunch, family style dinner options and a bar package. Pricing for our private lunch menus start at $24.95 and dinner options start at $32.95. Contact our private dining manager Michael Dyb at 847.465.9988 for more information.